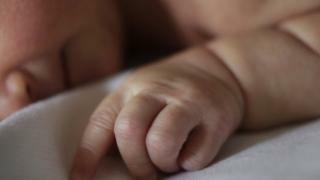 A woman who gave birth to twin babies in two hospitals 50 miles (80km) apart is to have her case reviewed by NHS Highland and the ambulance service. The woman first gave birth at a community hospital in Golspie while being taken by ambulance from Caithness to Raigmore Hospital in Inverness. Her second baby was delivered in Inverness after the woman was taken there by a second ambulance. The twins, and the woman, who has not been named, are said to be doing well. Her ordeal was raised at First Minister's Questions by Labour MSP Rhoda Grant on Thursday. Ms Grant said the assistance of two air ambulances were sought but they had been unable to land. The baby born at Golspie, about half way on the journey from Caithness to Inverness, was taken by road ambulance to Raigmore, before a second road ambulance was used to take the woman and her unborn child to the same hospital. First Minister Nicola Sturgeon said she would ask the health secretary to investigate the case. In a statement on Friday, NHS Highland said that due to patient confidentiality it could not comment on individual cases, but added: "The first priority for everyone at NHS Highland is for the safety and wellbeing of both mother and child and all of our procedures are intended to ensure that women have all the care that they need during this potentially stressful time." There is a midwife-led maternity unit at Caithness General Hospital in Wick supported by consultants in Inverness, but there are cases in which a woman's labour and delivery of her baby are handled in Inverness. A spokesman for NHS Highland said: "In terms of women travelling to Raigmore Hospital from Caithness, the clinical arrangements and contingency plans are the same as those that have been in place for the other long established midwife-led units in the Highlands and in other rural areas elsewhere in Scotland." The health board and the Scottish Ambulance Service (SAS) said they would review the recent case involving the woman and her twins. A spokesman for SAS said: "We cannot comment on individual cases. "However, for inter-hospital transfers clinicians at NHS Highland and the Scottish Ambulance Service carry out a full clinical assessment and jointly agree the safest and most appropriate type of response." He added: "Our priority is always patient safety and a number of factors are considered when transferring patients between hospitals. "We are working closely with our colleagues at NHS Highland to look into the circumstances of this case. We will be in touch directly with the patient." The Scottish government said it would ensure any lessons from NHS Highland's Significant Adverse Event Review would be learned. A government spokesman said: "We're sorry to hear about this mother's very stressful birth experience and are working closely with NHS Highland to understand the full circumstances surrounding this incident. "The health secretary is looking very closely into this issue and will investigate it further." He added: "We wish the mother and her twins well for the future, and thank all of the staff involved for their hard work in ensuring both twins were delivered safely and for the subsequent care given to them in the special care baby unit at Raigmore Hospital."